We’d love your help. Let us know what’s wrong with this preview of Kick by Walter Dean Myers. Kevin Johnson is thirteen years old. And heading for juvie. He's a good kid, a great friend, and a star striker for his Highland, New Jersey, soccer team. His team is competing for the State Cup, and he wants to prove he has For the very first time in his decades-long career writing for teens, acclaimed and beloved author Walter Dean Myers writes with a teen, Ross Workman. To ask other readers questions about Kick, please sign up. who many would chuck chucks are in a chuck chuck wood? The Title of my book is Kick. The author is Walter Dean Myers. The book was published in 2011 and it is a fiction book.The main character is Kevin. His a kid whose on probation trying to put him in Juvenile Detention Center. He has a really bad temper. His desire is to play soccer. Another important character would be Sergeant Brown he's the one who will decide if Kevin cam handle being in a normal school of if he has to go to Juvie. Kevin is a kid who got in trouble with the law. He was driving The Title of my book is Kick. The author is Walter Dean Myers. The book was published in 2011 and it is a fiction book.The main character is Kevin. His a kid whose on probation trying to put him in Juvenile Detention Center. He has a really bad temper. His desire is to play soccer. Another important character would be Sergeant Brown he's the one who will decide if Kevin cam handle being in a normal school of if he has to go to Juvie. Kevin is a kid who got in trouble with the law. He was driving a car with his girl, when he didn't had a license. The car was from the girl's dad. Kevin crashed into a light pole. When the dad found out he pressed charges on Kevin. Since then Kevin has to be on probation and not to do something bad, or else he'll go to Juvenile Detention Center. He plays soccer but can't really trust him because his temper is really bad, he gets into fights so easy. Sergeant Brown need to change Kevin if he doesn't want him to go to Juvie. Can he do it? Kevin is a kid that gets arrested for crashing a car. He doesn't want to go to juvie, but he won't tell why he 'accidentally' crashed the car. When Sergeant Brown hears about Kevin, he decides to help Kevin. Kevin is a football player, and his team is preparing to play in the league, but because of the arrest, he might not be able to play. Read this book which is about hope, perseverance, and fate. In the book Kick by Walter Dean Myers and Ross Workman there is a boy named Kevin who gets in trouble and it involves a car wreck involving him and a girl. Kevin plays soccer for his school and is nervous about juvie and charges. There is a police sergeant named Jerry Brown who tries to help Kevin and find out what happened during that night. Kevin is a very talented soccer player but has some issues that affect him. Kevin's mother is disappointed and the girls father is angry but Sergeant Brown In the book Kick by Walter Dean Myers and Ross Workman there is a boy named Kevin who gets in trouble and it involves a car wreck involving him and a girl. Kevin plays soccer for his school and is nervous about juvie and charges. There is a police sergeant named Jerry Brown who tries to help Kevin and find out what happened during that night. Kevin is a very talented soccer player but has some issues that affect him. Kevin's mother is disappointed and the girls father is angry but Sergeant Brown tries to talk to him. I think that is a good book in general even though with the changing perspectives after each chapter can get confusing but also helps add some suspense to the story. It uses good imagery as you can pretty much see the story unfold in your head. The book has a very good plot and it does a good job using time in the story as the questioning of Kevin and the soccer games go along. This is a really good book with a good plot and imagery. Kick by Walter Dean Myers is a great book for kids 13 and older with the lexile of 710. This book was published on November 1 ,2011. Kick is mainly about a great 13 year old soccer player name Kevin Johnson. In the beginning of the book, Kevin is at the mall with his friends, and soon he finds out that his friend Christy’s, mom is going to commit suicide. Kevin goes with Christy and takes her dad’s car to find her mom. But, Kevin gets into an accident. Kevin’s mentor Sargent Brown comes and ta Kick by Walter Dean Myers is a great book for kids 13 and older with the lexile of 710. This book was published on November 1 ,2011. Kick is mainly about a great 13 year old soccer player name Kevin Johnson. In the beginning of the book, Kevin is at the mall with his friends, and soon he finds out that his friend Christy’s, mom is going to commit suicide. Kevin goes with Christy and takes her dad’s car to find her mom. But, Kevin gets into an accident. Kevin’s mentor Sargent Brown comes and take the kids to the police department. Sargent Brown wanted to help Kevin as much as he can because he knew Kevin’s dad that recently passed away. When Kevin and Christy get to the police department they were asked to explain what happened, but the kids did not say anything. If they do not find out what happened Kevin could go to Juvie. even though he didn’t know what happened. The worst part is Kevin, the best player on his soccer team, might be charged for kidnapping and may not be able to participate in the last game. He talked about the accident and explained to Sargent Brown because he wanted to play the next weekend. Kevin was allowed to play in the upcoming game, and his team and ended in a draw. But the team had to go to penalty kicks. Kevin takes the last penalty kick, he shoots, and he hits the post. It was horrible for him. He lost the most important soccer game of his career. A couple days after the game Sargent Brown and Kevin discussed more about the accident.Christy’s Dad didnt want to press charges anymore. Until Christy announced that her mom wanted to commit suicide because her dad was beating her mom. I rate this book a 9/10. This is because in the begging I was really confused. Like when Kevin gets in a crash and goes to jail. I honestly thought i was reading a different book because I expected to read a book about soccer. Then after reading more of the story it is more about Kevin getting into trouble rather than about the actual sport. This is why i rated this book a 9/10. If you like fictional books I recommend Kick by Walter Dean Myers to you. The book Kick was a very well written book. It has a good plot, two amazing main characters, and a feel to it that makes you on the edge of your seat. One of the main characters is a young soccer player, Kevin Johnson, who is convicted of a crime and is sent on parole. His parole officer is the other protagonist, Sergeant Brown. These two seem like they would not be able to work with out each other. That is why they help the purpose of the book which is to entertain. I do find this book entertaining, especially that I am in the perfect audience area for this book. The point of view was always switching between the two. After each chapter, The point of view would change. Sometimes reading a book for entertainment has a theme that is very subtle, the theme of this book is very hard to depict, because it is for entertainment. However, the one theme that stands out the most is sometimes selfishness is better than being selfless. The reason I believe that Walter Dean Myers says this is in the book Kevin could have been selfish in the crime he committed and save a lot of heartache for himself and his family, but decided to be selfless for his friend and protect her family. Kevin explains much of this when he states "I couldn't tell my mom or my abuela (grandmother) because they've been through so much" (152). The part in which he says, they have through so much is the arrest and anything else would have set him off. That is why the theme stands out to me in this part of the book. The style of a book is an important part of a book. Since this book is an entertaining book, it has a style of narration. The author did a great job of applying this style and it worked very well. I feel that narration has the most suspense. It creates more problems for the protagonist to make it feel more stressful. Walter Dean Myers also did a good job at forcing a new problem before one is resolved. "They're setting your hearing date for your case" (131). That is an example of one problem put on Kevin right before he was going to forget about his problems and start to focus on what he wants and not forced to think of his problems. The way he uses this style is very good and fits the book very well. Do I think it was effective, yes I do. Kick was a great book. It could even be considered one of my favorites. It was about my favorite sport, soccer. The way he described how Kevin's team played was easily imaginable. I also liked that there was not a single plot. What I mean by that is the plot didn't focus on one thing. Kevin had to focus on his soccer games and his arrest. this always made reading the book a pleasure because I would never get bored. If I had to change the book, I wouldn't. The book is just to good and should not be changed. The book, Kick , is about a 13 year-old boy named Kevin Johnson. He was a teenager headed to juvenile hall. Kevin had potential to be a great teenager, and was a star striker Highland New Jersey, soccer team. His team were competing in the state cup, and Kevin wants to show people that his true potential and how good he really is. He has never been in serious trouble before, until he tried to help out a friend. He was driving a car without a license and crashed into a light pole.Kevin is on probation so he tries to stay out of trouble by playing soccer. It's really hard for him because he has a bad temper. Sergeant Brown is the officer assigned to keep an eye on him, to make sure he stays out of trouble and be his mentor. Kevin and Brown don't usually get along, but they have to if Kevin wants to change, so he can play in the State Cup. I thought the ending was the best part of the book.It was a happy ending when Kevin finally decided to change his behavior, and him and his team won the State Cup.Kevin and Brown didn't see eye-eye but at the end they got along really well and became friends.This book compared to Walter Dean Myers other books was one of the best.I believe he put more effort than the other books he wrote.I think he took his time writing this book because it was supposed to give the reader a message.The message in this book was to never give up,and to choose wisely in the choices you make. Kevin Johnson is a thirteen year old star soccer player for his team in New Jersey. He has his moments when he goes over the top when he gets angry, but he never goes too far. Until one night. When Kevin winds up in jail his life changes. And somehow, all he can think about is the State Cup his team is competing in in a few weeks. Kevin knows he can't miss that game, he is one of the best on his team. Will he behave or get too overwhelmed and make a bug mistake on the field. Sergeant Brown has b Kevin Johnson is a thirteen year old star soccer player for his team in New Jersey. He has his moments when he goes over the top when he gets angry, but he never goes too far. Until one night. When Kevin winds up in jail his life changes. And somehow, all he can think about is the State Cup his team is competing in in a few weeks. Kevin knows he can't miss that game, he is one of the best on his team. Will he behave or get too overwhelmed and make a bug mistake on the field. Sergeant Brown has been in the force for a long time. He had been assigned to be Kevin's mentor during this entire stressful and tense time in the Johnson's life. They don't see eye to eye on everything but what if seeing eye to eye is the only way to get Kevin out of trouble. Sergeant Brown and Kevin will need to trust each other, or things may go terribly wrong. Kick is a great book. You don't know what the main character is going to do next and it always leaves you wondering what if. You don't have to love soccer to enjoy this book. Walter Dean Myers has long been my go to recommendation for young men who don't think books still matter to them. So seeing that he'd tried his hand at a soccer player's story, I was quite hopeful. The story of Kick is in keeping with Myers talents (a gifted kid on the brink of trouble, trying to hold himself and his family together against an urban/sporty backdrop). But the execution is uneven. His co-author (teenage writer Ross Workman) is just finding his voice and occasionally lapses into tan Walter Dean Myers has long been my go to recommendation for young men who don't think books still matter to them. So seeing that he'd tried his hand at a soccer player's story, I was quite hopeful. The story of Kick is in keeping with Myers talents (a gifted kid on the brink of trouble, trying to hold himself and his family together against an urban/sporty backdrop). But the execution is uneven. His co-author (teenage writer Ross Workman) is just finding his voice and occasionally lapses into tangents, or character decisions that can leave you scratching your head. In the audiobook I listened to he was further burdened with a narrator who never raised the emotional stakes above those of an oral presentation in English class. Kevin was a preteen that just wanted to help a friend out, but his intentions turned bad to the police after he was caught in a car with his friend, so he was taken to detention center where he was awaiting his trial, then he was lucky enough to have counselling from sergeant brown. He was closely watched. He made a couple mistakes at first, but then grew to be a good kid. this book is about development, forgiveness and friendship. Kick is a very brief story about soccer and a kid in the wrong place at the wrong time. In collaboration with an actual young adult, Ross Workman, Walter Dean Myers has co-authored a story which is sure to be a hit with the athletic, male reluctant reader set. What I think about this book is that it shows a teens life when there in a hard situation like Kevin. Also im really enjoying this book because Its about a teen who is trying to reach his dream to become a professional soccer player. Walter Dean Myers is a fantastic writer. I have read a few of his books, but this book is not the best. Kick is not a terrible book, however it could be a lot better. If you were to ask me if you should read it, I would say that you should give the book a chance. Kevin wants to just enjoy his life being part of the soccer team but one day he gets himself into a lot of trouble helping a friend so he has to go to the court then he tries to get out of the situation as well as winning the state cup. This is a story of courage, family, and passion. Not a bad story. Not spectacular, but not bad. Recommended for middle school boys, especially if they like soccer. The Title of my book is Kick and the lexile level is 710L. The author is Walter Dean Myers. The book was published in 2011 and it is a fiction book.The main character is Kevin. His a kid whose on probation trying to put him in Juvenile Detention Center. He has a really bad temper. His desire is to play soccer. Another important character would be Sergeant Brown he's the one who will decide if Kevin can handle being in a normal school of if he has to go to Juvie. Kevin is a kid who got in trouble The Title of my book is Kick and the lexile level is 710L. The author is Walter Dean Myers. The book was published in 2011 and it is a fiction book.The main character is Kevin. His a kid whose on probation trying to put him in Juvenile Detention Center. He has a really bad temper. His desire is to play soccer. Another important character would be Sergeant Brown he's the one who will decide if Kevin can handle being in a normal school of if he has to go to Juvie. Kevin is a kid who got in trouble with the law. He was driving a car with his girl, when he didn't have a license. The car was from the girl's dad. Kevin crashed into a light pole. When the dad found out he pressed charges on Kevin. Since then Kevin has to be on probation and not to do something bad, or else he'll go to Juvenile Detention Center. He plays soccer but can't really trust him because his temper is really bad, he gets into fights so easy. Sergeant Brown need to change Kevin if he doesn't want him to go to Juvie. Can he do it? One of the best passages from this occurs on page 96 when "Kevin, get ready! coach yelled. He walked onto the field to check on Robby. It's about time I though". This part of the book was important because he wasn't going to play at all but once he got in he scored and finally won, and they advance to the next stage thanks to Kevin. If you like soccer and adventure, then you'll enjoy this book because Kevin has to keep out of trouble so that he's able to play soccer. This book reminds me of a book when I was younger but can't remember the title. Choose Kick by Walter Dean Myers as your next reading book because I think it'll keep you entertained for a while. The book is “Kick” by author, Walter Dean Myers. The main character is Kevin Johnson who is a young talented soccer player, who never got into trouble till one day he makes an unwise decision that turns things around in his life. Sergeant Brown is my favorite character because he is helping Kevin with his case. The background they gave Sergeant Brown makes his character come to life. 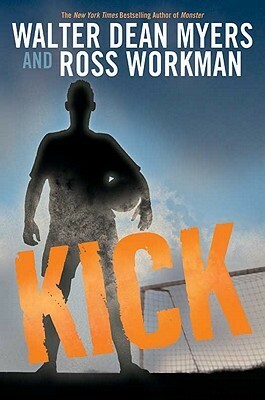 With all the things happening in the book, such as the perspective of the story switching between the characters, The book is “Kick” by author, Walter Dean Myers. The main character is Kevin Johnson who is a young talented soccer player, who never got into trouble till one day he makes an unwise decision that turns things around in his life. Sergeant Brown is my favorite character because he is helping Kevin with his case. The background they gave Sergeant Brown makes his character come to life. With all the things happening in the book, such as the perspective of the story switching between the characters, sergeant brown and Kevin Johnson, It makes it easier to get an understanding of the story line of the book. The book was very good and it really got my interest on the the book, which made me want to see what was next in the story. The narration in the book really helped add suspense into the story. One thing that I did not like about this book was that the beginning of the story was a bit confusing because Kevin got arrested and I thought It would mainly be about soccer. There was a part of the story that was just there and had no point in the story, which is the immigrant workers. This book is very intriguing and interesting with a lot of twist and turns to the story line. I think that this book would best fit readers who are into a good mystery, crime, novel with some soccer stuff. I would rate this novel a four out of five. Kick is a mystery by Walter Dean Myers that depicts a boy named Kevin. Kevin is a Hispanic soccer player for his high school, and he is also friends with a girl named Christy who alongside him gets into trouble. Due to this Kevin is arrested for grand theft auto and damage causing him to be visited by detective brown. Detective Brown helps Kevin throughout the book trying to figure out how to get him out of the trouble he has put himself in. This creates a sense of friendship between the two and Kick is a mystery by Walter Dean Myers that depicts a boy named Kevin. Kevin is a Hispanic soccer player for his high school, and he is also friends with a girl named Christy who alongside him gets into trouble. Due to this Kevin is arrested for grand theft auto and damage causing him to be visited by detective brown. Detective Brown helps Kevin throughout the book trying to figure out how to get him out of the trouble he has put himself in. This creates a sense of friendship between the two and develops throughout the story. Walter Dean Myers uses each chapter to take a look at the crime from the two perspectives of Kevin and Detective Brown. Even though Kevin doesn’t admit why he actually was at the crime scene for a while into the book this just increases the amount you want to read so that you can find out the actual reason. This was a good strategy on Myers part because it keeps the reader interested on the plot even though it’s rather basic and shallow. Sergeant Jerry Brown is asked to look into a case of Kevin Johnson, a 13-year old arrested for car theft and kidnapping. Kevin was with another 13-year old, Christy, driving Christy's dad's car. Kevin has a few secrets to keep and isn't sure if he can trust Sergeant Brown. His own father was killed in the line of duty and Kevin doesn't know how to handle the grief and anger that come with that. He's sure that he was doing a good thing for Christy but it has definitely gotten him into trouble. As Sergeant Jerry Brown is asked to look into a case of Kevin Johnson, a 13-year old arrested for car theft and kidnapping. Kevin was with another 13-year old, Christy, driving Christy's dad's car. Kevin has a few secrets to keep and isn't sure if he can trust Sergeant Brown. His own father was killed in the line of duty and Kevin doesn't know how to handle the grief and anger that come with that. He's sure that he was doing a good thing for Christy but it has definitely gotten him into trouble. As Kevin tries to help Sergeant Brown with another case, play soccer, and keep his nose out of trouble, something will have to give. When he finally decides to tell what happened the night in question, will it all work out? The name of my book is called Kick written by Walter Dean Myers, and this book has really inspired me because it's about soccer and I myself love to play soccer. The book is about this boy which is the main character named Kevin and in the book Kevin made one mistake in his life which caused him to end up in jail but the good thing is that the officer that looked in his case was like family relative. The officer tried helping him to not stay in jail for life. After that the officer does help him and he gets out of jail but the one thing is that he had to be playing a sport, so that's when he mentioned that he plays soccer and then he was put in a team and that’s when it all started and where he became a good player. The major plot event would be the about where he starts to play soccer and that’s what basically changes his life My opinion on the book would be that’s it's a great book I myself enjoyed the book mainly because it’s related to soccer. The target audience for this book would be the people that love and play soccer. KICK is about a kid named Kevin that gets arrested for crashing a car that he stole into a pole. He doesn't want to go to juvie but for some reason he doesn't want to tell the reason why he crashed the car on ‘accident’. Then someone named Sergeant Brown hears about kevin he wants to help him out. Kevin plays soccer but he might not be able to play because of what happened. I personally did not like this book because I thought it was going to be more about soccer but it was mostly about the cri KICK is about a kid named Kevin that gets arrested for crashing a car that he stole into a pole. He doesn't want to go to juvie but for some reason he doesn't want to tell the reason why he crashed the car on ‘accident’. Then someone named Sergeant Brown hears about kevin he wants to help him out. Kevin plays soccer but he might not be able to play because of what happened. I personally did not like this book because I thought it was going to be more about soccer but it was mostly about the crime he committed. I would recommend this book to those who like crime and soccer. But I would not recommend it if you are looking for a book about soccer. I don’t really like the book that much. It has a good start to it but it just dulls out for the rest of it. There are immigrant workers who have nothing to do with the story there just to be their. The don’t have a story to them and they all have like one line. In conclusion the book is ok but not for me. This review has been hidden because it contains spoilers. To view it, click here. I liked it because it was a story about a young boy who likes to play soccer and has been going through a lot at the moment and has gotten in trouble with the Law. He uses soccer to try to get out of trouble and he successfully got away with it.